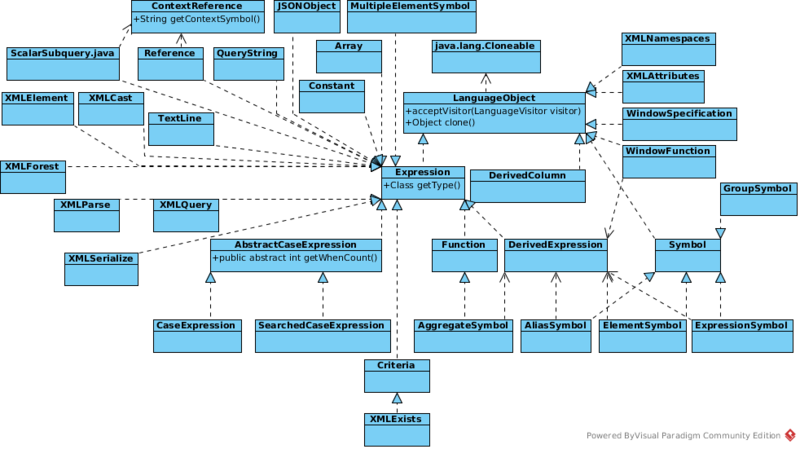 org.teiid.query.sql.LanguageObject is the primary interface for all language objects(There mainly 2 kinds of language objects: language objects, symbol objects, procedure language objects). The LanguageObject extends the java.lang.Cloneable and define a acceptVisitor method for the language object to call back on the visitor. Language objects are too complex, we split into 3 sections: Command, Criteria, From Clause and others. A Command is an interface for all the language objects that are at the root of a language object tree representing a SQL statement. For instance, a Query command represents a SQL select query, an Update command represents a SQL update statement, etc. The org.teiid.query.sql.lang.Criteria represents the criteria clause for a query, which defines constraints on the data values to be retrieved for each parameter in the select clause. FromClause - A FromClause is an interface for subparts held in a FROM clause. One type of FromClause is UnaryFromClause, which is the more common use and represents a single group. Another, less common type of FromClause is the JoinPredicate which represents a join between two FromClauses and may contain criteria. org.teiid.query.sql.lang.Select - represents the SELECT clause of a query, which defines what elements or expressions are returned from the query. NOTE: QueryParser will parse a SQL String to a language Command Object, this also the first step of Teiid Query Engine process client request. NOTE: QueryParser will parse a SQL String to a language CompareCriteria Object, this also the first step of Teiid Query Engine process client request. The Expression is the interface for an expression in a SQL string. Expressions can be of several types (see subclasses), but all expressions have a type. These types are used for type checking. The Symbol is the server’s representation of a metadata symbol. The only thing a symbol has to have is a name. This name relates only to how a symbol is specified in a user’s query and does not necessarily relate to any actual metadata identifier (although it may). Subclasses of this class provide specialized instances of symbol for various circumstances in a user’s query. In the context of a single query, a symbol’s name has a unique meaning although it may be used more than once in some circumstances. org.teiid.query.sql.symbol.GroupSymbol - This is the server’s representation of a metadata group symbol. The group symbol has a name, an optional definition, and a reference to a real metadata ID. Typically, a GroupSymbol will be created only from a name and possibly a definition if the group has an alias. The metadata ID is discovered only when resolving the query. org.teiid.query.sql.symbol.ElementSymbol - This is a subclass of Symbol representing a single element. An ElementSymbol also is an expression and thus has a type. Element symbols have a variety of attributes that determine how they are displayed - a flag for displaying fully qualified and an optional vdb name. The Statement represents the a statement in the stored procedure language. The subclasses of this class represent specific statements like: IfStatement, AssignmentStatement, ReturnStatement, LoopStatement, WhileStatement, etc. org.teiid.query.sql.LanguageVisitor is one of key api of teiid query sql api. The LanguageVisitor can be used to visit a LanguageObject as if it were a tree and perform some action on some or all of the language objects that are visited. The LanguageVisitor is extended to create a concrete visitor and some or all of the public visit methods should be overridden to provide the visitor functionality. These public visit methods SHOULD NOT be called directly. NOTE: There are 3 kinds of visit methods: Visitor methods for language objects, Visitor methods for symbol objects, Visitor methods for procedure language objects. The PreOrPostOrderNavigator overwrite the public vist methods listed in LanguageVisitor, add define additional 2 public static doVist method. The DeepPreOrderNavigator and DeepPostOrderNavigator used for deep navigation, the PreOrderNavigator and PostOrderNavigator for no deep navigation, each of them also supply a public static doVist method. AbstractSymbolMappingVisitor - It is used to update LanguageObjects by replacing one set of symbols with another. There is one abstract method which must be overridden to define how the mapping lookup occurs. StaticSymbolMappingVisitor - It is used to update LanguageObjects by replacing the virtual elements/groups present in them with their physical counterparts. It is currently used only to visit Insert/Delete/Update objects and parts of those objects. CommandCollectorVisitor - This visitor class will traverse a language object tree and collect all sub-commands it finds. It uses a List to collect the sub-commands in the order they’re found. The easiest way to use this visitor is to call the static methods which create the visitor, run the visitor, and get the collection. The public visit() methods should NOT be called directly. CorrelatedReferenceCollectorVisitor - This visitor class will traverse a language object tree and collect references that correspond to correlated subquery references. The easiest way to use this visitor is to call the static method which creates the visitor by passing it the Language Object and the variable context to be looked up. The public visit() methods should NOT be called directly. 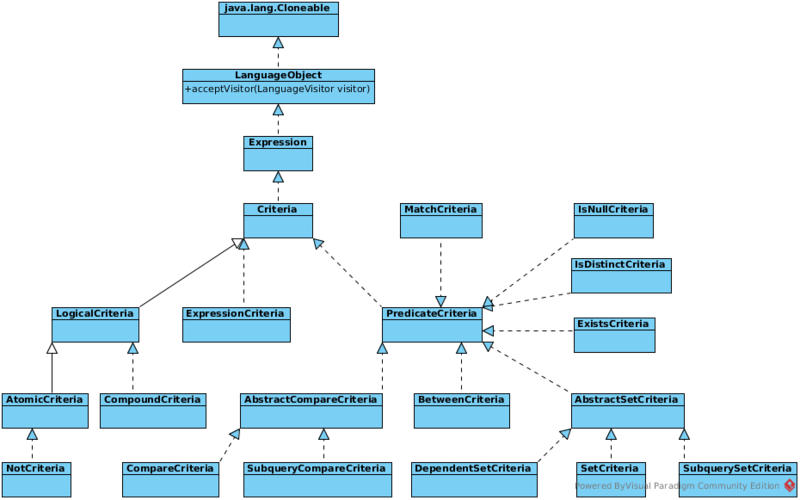 ElementCollectorVisitor - This visitor class will traverse a language object tree and collect all element symbol references it finds. It uses a collection to collect the elements in so different collections will give you different collection properties - for instance, using a Set will remove duplicates. The easiest way to use this visitor is to call the static methods which create the visitor (and possibly the collection), run the visitor, and return the collection. The public visit() methods should NOT be called directly. 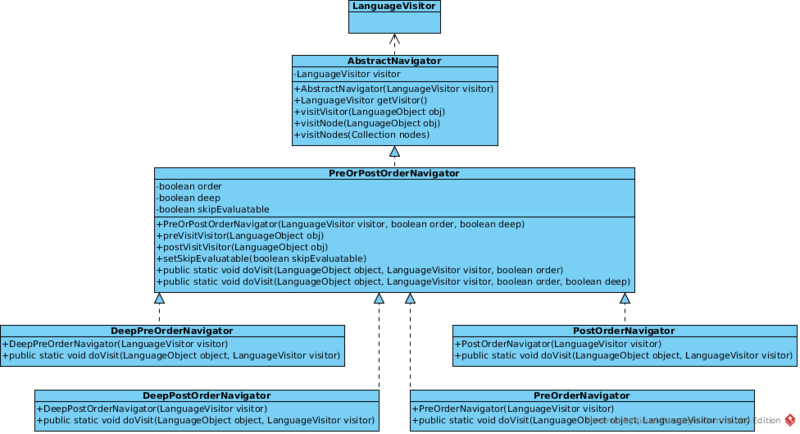 EvaluatableVisitor - This visitor class will traverse a language object tree, and determine if the current expression can be evaluated. 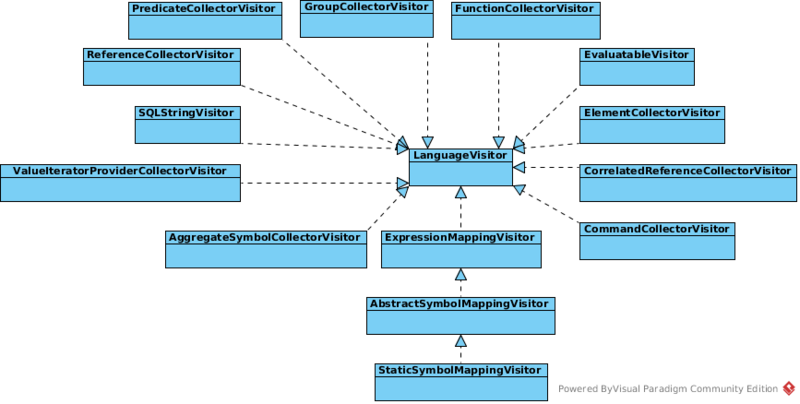 FunctionCollectorVisitor - This visitor class will traverse a language object tree and collect all Function references it finds. It uses a collection to collect the Functions in so different collections will give you different collection properties - for instance, using a Set will remove duplicates. This visitor can optionally collect functions of only a specific name. The easiest way to use this visitor is to call the static methods which create the visitor (and possibly the collection), run the visitor, and return the collection. The public visit() methods should NOT be called directly. GroupCollectorVisitor - This visitor class will traverse a language object tree and collect all group symbol references it finds. It uses a collection to collect the groups in so different collections will give you different collection properties - for instance, using a Set will remove duplicates. The easiest way to use this visitor is to call the static methods which create the visitor (and possibly the collection), run the visitor, and get the collection. The public visit() methods should NOT be called directly. 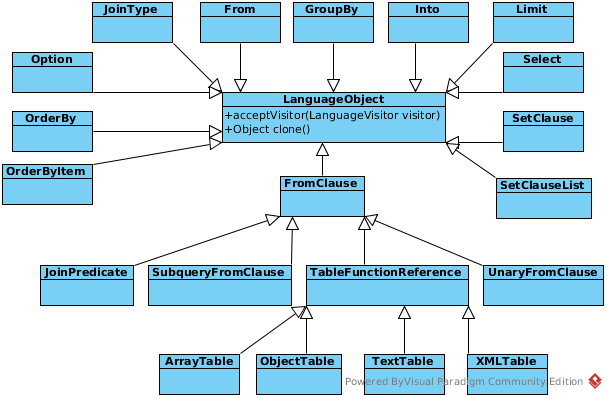 ReferenceCollectorVisitor - his visitor class will traverse a language object tree and collect all references it finds. The easiest way to use this visitor is to call the static methods which create the visitor (and possibly the collection), run the visitor, and return the collection. The public visit() methods should NOT be called directly. SQLStringVisitor - The SQLStringVisitor will visit a set of language objects and return the corresponding SQL string representation. ValueIteratorProviderCollectorVisitor - This visitor class will traverse a language object tree and collect all language objects that implement SubqueryContainer. By default it uses a java.util.ArrayList to collect the objects in the order they’re found. The easiest way to use this visitor is to call one of the static methods which create the visitor, run the visitor, and get the collection. The public visit() methods should NOT be called directly.